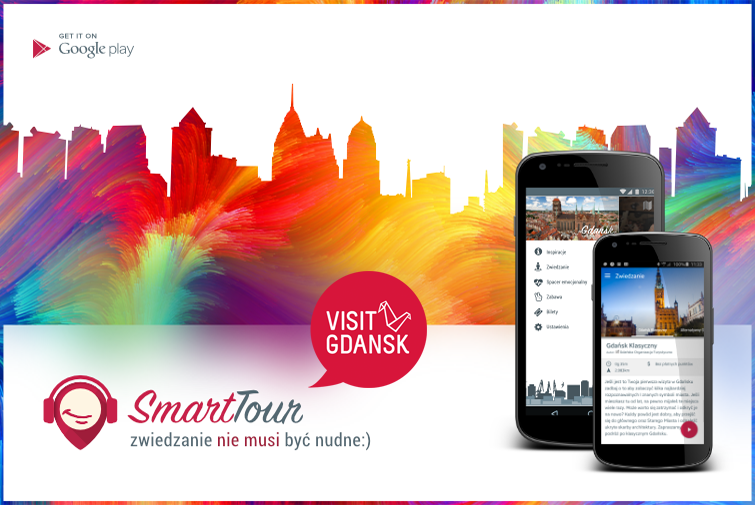 The latest mobile application SmartTour will make it possible for you to learn about the most beautiful corners of Gdańsk and their fascinating history. You just need to have a smartphone to go on a fascinating journey through the 1000 years’ old Gdańsk! SmartTour is a guide for mobile phones. In addition to a very convenient form of ticket purchase, it enables you to select a sightseeing path and guides you through the city, a museum or a gallery. “Tourists want to stay up to date. Most of them are willing to try out technical novelties if using them is simple and makes their life easier. And this is what SmartTour offers”, maintains the President of the Gdańsk Tourist Organization, Łukasz Wysocki. What makes the Smart Tour application different than the others? Three aspects are particularly worthy of attention among many characteristics distinguishing SmartTour from earlier solutions of that type. The first aspect refers to the way in which contents are generated. Thanks to a special platform, they are generated by different organizations responsible for tourism in the city or in cultural institutions. They know best what the most beautiful or unique things that they can show are. The tool is excellent both for the guiding of outdoor tours and inside buildings. The variety of paths is another aspect. SmartTour can operate in the form of a traditional guide and it can also become a role-playing game making it possible to lead an investigation, solve riddles or puzzles. Everything depends on the imagination of the person creating the sightseeing path. The last aspect refers to the fact that the application operates in various places. We do not have to download a separate application for each city or facility. Thanks to the cooperation of qb-mobile, the Gdańsk Tourist Organization, Gdynia and Wejherowo Town Halls and the Sopot Seaside Resort, SmartTour already operates in the Tricity and its vicinity while the number of cities and facilities interested in its introduction is growing, especially because the guide is free. Recreation. Paths in this section are the best recipe for having fun. Let yourself be guided to the best restaurants, pubs, discos and other recreational facilities and have fun! Additionally, the application has a “In the vicinity” function thanks to which you can quickly and easily find restaurants, pubs, hotels and other tourist facilities near your current location. You will not have to worry about the ticket purchase anymore. Thanks to Smart-Tour, you will buy a ticket easily by using your phone! Buy the Tourist Card and visit Gdańsk with the application! Download the application and find your method for Gdańsk! SmartTour will lead you along the routes from the Tourist Card. Choose your favourite package and use the option of navigation between attractions. “The application is intuitive and offers many possibilities. In addition to reading and listening to the information about individual locations, you will also get the info about discounts available to Tourist Card holders in different places. What is more, SmartTour will also make it possible for you to buy a Tourist Card”, informs Michał Sarnowski from qb-mobile. “For example, when you pass an X restaurant, you will get a notification that you can get a discount there as a holder of the Tourist Card. You do not even have to know that you are passing that restaurant; Smarttour will know and it will tell you”, he adds. The platform is developed by qb-mobile s.c. in the Pomeranian Science and Technology Park in Gdynia. The company has officially been in operation since April 2014, however, many years of experience of its founders made it possible for them to complete a few interesting projects, also international ones in that short time. A fact worth noting is that qb-mobile s.c. is a technological partner of the Gdańsk Tourist Organization in the development of the Tourist Card that changes dynamically and is an extremely interesting offer for those willing to visit or have fun in the Tricity. See more at: www.smart-tour.pl.